After our trip down to the tree we started the trek back to our hotel and were in need of something to warm us up (read more drinkies). 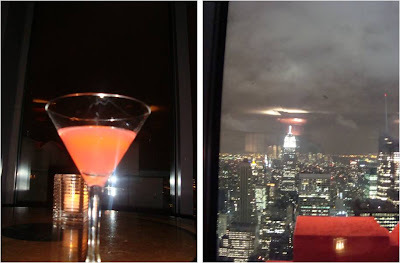 One of the things I was told was a must was to go to the top of the Rainbow Room at the NBC Building and have a drink and enjoy the amazing view. SO since we were right there… that’s where we went – all the way to the top. However first we were told we’d have to wait in line –WHAT – we wait in line for no one, no thing, no how – and where was this line this elevator spoke of? HA! No waiting allowed – well except for like 5 minutes. Then we whisked to the top, checked our coats and ordered drinks. The bar area is beautiful and we actually presented the Rainbow Room a prize – most expensive drink we’ve had to pay for – ever. $27 a martini! (Note the part about us having to pay for them) Apparently the winner prior was the Wynn in Las Vegas, but I wasn’t there for that so not sure the exact context of that. No matter – we were on vacation! We had one drink, Brittany had an entire bowl full of nuts and we got some great pictures and headed back down the elevator! … and on to our next adventure. Oh my gosh… a $27 martini! I had a $20 martini in NYC and thought that was crazy. I love vacay.